This class is now filled. You may still fill out the registration to be put on a WAITING LIST. Please wait for us to respond to let you know if space is available. We hope that you'll join us at a future series. In the meantime, please join us at our weekly Sunday Awakening Heart gatherings or other group at Dallas Meditation Center. Facilitated by Brother ChiSing, M.Div., M.A. 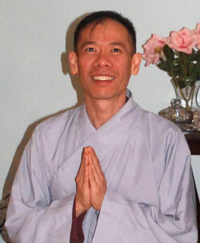 Please join Brother ChiSing, a lay-ordained disciple of Thich Nhat Hanh, for his last (and best) class series of 2015. Based on Don Miguel Ruiz' book "The Four Agreements" and his sequel "The Fifth Agreement," we will add insights and practices from Interfaith Buddhist spirituality and other enlightened traditions. Each week will also include easy guided meditations and simple homework assignments. Come and make new friends as we put the Five Agreements into practical application! "[This] is a roadmap to enlightenment and freedom." To participate, you must attend all 6 Mondays (or at least 5 Mondays). If you need to miss any of the weeks, please arrange with the facilitator). 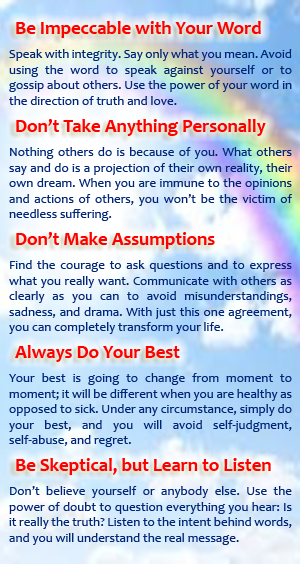 Watch these introductory videos on "The Four Agreements"
• Full payment online is required at the time of registration. Registrations for this class are no longer being accepted. You may still fill out the registration to be put on a WAITING LIST. Please wait for us to respond to let you know if space becomes available.